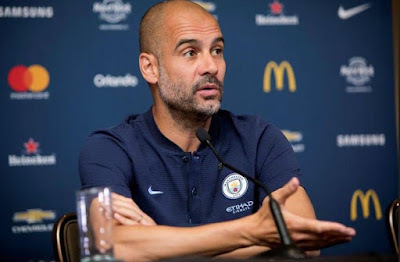 Manchester City manager, Pep Guardiola says Premier League rivals, Chelsea and Manchester United will not be afraid to face City despite their rampaging recent form. The Sky Blues hammered Crystal Palace 5-0 win on Saturday to become the first English top-flight side since Blackburn Rovers in 1958-59 to score five or more goals in three consecutive matches. Liverpool and Watford have also been put to the sword by Guardiola’s men in recent weeks and Feyenoord were on the receiving end of a 4-0 beating in City’s Champions League opener. “And I think United have five clean sheets in a row [five out of six in the Premier League]. “It is such tough competition. All the big teams are strong. "It’s not necessary for me to tell them, they know that. “But the way we play, we can improve in many things and many concepts. That’s what is next,” Guardiola said.